One of the reasons the line exists is because once you get to the front of it, they will allow you to taste any or all of the flavors on the board-and with such interesting and unusual flavors, how can you not try them all? The Krispy Kreme flavor tasted exactly like a Krispy Kreme glazed doughnut. I am not sure how they pulled of that miracle but it was spot on! I ordered the Flan Caramello which was absolutely divine. 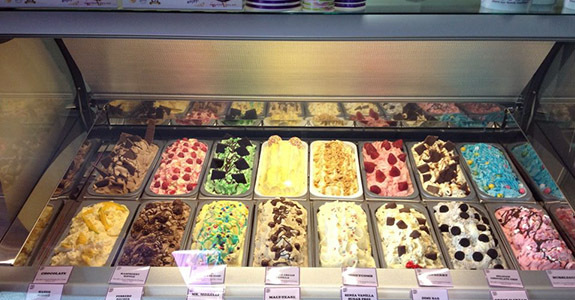 Besides the flavors being perfect, what makes Morelli's my fave is the luscious creaminess. It's not overly rich but it's smooth as silk, no ice crystals or air bubbles, just pure ice cream plain and simple with flavors that just explode. I don't know how they do it, but it's truly the best ice cream we've ever had...and we've had a lot...everywhere. If you find yourself in Atlanta...you MUST try this very special treat. There are two locations and both are fabulous and you can even check out their flavor boards on line before you go. Enjoy! Sign Up For Explore All 50's Newsletter!